How can Intramuscular stimulation (IMS) help you? If you suffer from chronic pain and have tried medications, massage, traditional physiotherapy, osteopathy, or chiropractic and still do not find lasting relief, your pain could be caused by muscle shortening. Muscle shortening produces pain by pulling on tendons, straining them as well as distressing the joints they move. This constant strain can press on and irritate your nerves, leading to a condition now recognized as “super-sensitivity”. IMS can help this condition by inducing the shortened muscle to relax which relieves the pain. 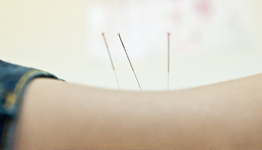 We use instruments adapted from traditional acupuncture and each treatment stimulates a certain amount of healing, until eventually, the condition is healed and the pain disappears. In pain of recent origin, one treatment may be all that is necessary. In recent published studies of patients with low back pain, the average number of treatments required was eight. What is Intra Muscular Stimulation? Intra Muscular Stimulation (IMS) is a total system for the diagnosis and treatment of chronic pain conditions that occur in the musculoskeletal system when there is no obvious sign of injury or inflammation. Intramuscular Stimulation (IMS) is a ‘dry needling’ technique that involves the insertion of very thin needles (without the injection of any substance) into shortened muscles in order to help loosen and relax them. These shortened muscles with tender and painful bands (often containing trigger points) are implicated in many presentations of soft tissue pain when there are no signs of injury/ongoing tissue damage or inflammation. Muscle shortening is a primary feature of “neuropathic pain” and can result from minor irritation of a nerve that supplies the involved muscle(s). This type of pain called “neuropathic pain”, is often misunderstood and is difficult for doctors to diagnose and treat because it usually appears with no sign of tissue damage or inflammation. Please click here for more detailed information on IMS. As with all of our services, if you would like more detailed information, email us at info@physioactive.ca or contact your chosen Physiotherapist directly.